Settling into a new job and training for a marathon has led to a lot of pasta being eaten in this house lately. 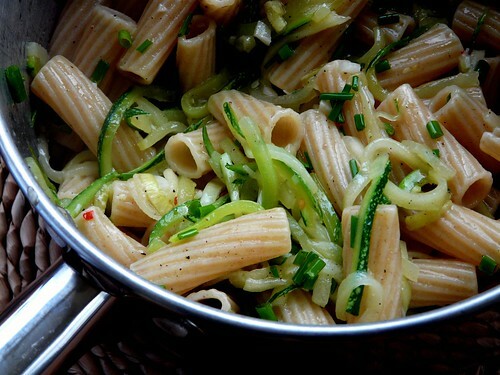 One of our favourite dishes at the moment is the following courgette, garlic and chilli pasta. It’s super-easy, super=quick, carb-tastic and (hooray!) helps us use up some of our garden courgettes. Bring a large pan of water to the boil. Add the pasta. Add the oil, garlic and chilli and heat gently. Once the garlic becomes fragrant and starts to sizzle, add a good pinch of salt and pepper followed by the courgette. Stir well to combine. Increase the heat and cook until the courgette is tender. This won’t take long. Drain the pasta and combine with courgette. Serve topped with parsley and Parmesan cheese. This entry was posted in Food, Recipes and tagged carbohydrates, courgettes, fuel, pasta, recipe, training. Bookmark the permalink. yum, sounds lovely! and with my the ginormous courgette that recently landed in my lap i think this will be something neat to cook soon! Great photo, great recipe. I love the look, it’s so healthy and wholemeal pasta is so delicious… so much more flavour than normal pasta, perfect for the simpler dishes. ooo yum. I just got back from a week in NH at my parents’ and am off to the greenmarket first thing. Now I know what lunch tomorrow is. Can’t wait! YUM, think I might try this today! you are doing an ace job-new job and training-I have given up with my running for the moment-but will still make the fuel pasta! Stunning. Very similar to a recipe I found at http://www.bestforchef.com and just as tantalizing. great picture! this is the kind of thing i make a lot during the week as well… a little pasta, whatever veggies are in abundance that day, and some parmesan! zucchini are always a staple in my house as well so i can’t wait to try this recipe!